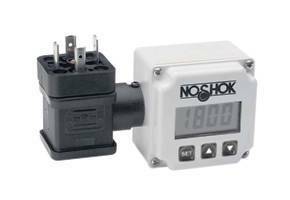 The Noshock 1800 Series Attachable Loop-Powered Digital Indicator provides convenient local indication and is easily inserted into a variety of NOSHOK transmitters, including 300 Series Compact OEM Pressure Transmitters, 615/616 Series High Accuracy Pressure Transmitters, and 800 Series Platinum Resistance Temperature Transmitters. Simply inserted between the transmitter body and the connector without the need for additional wiring or power source, the unit is programmable to display a range of -1999 to 9999 and can be tilted for better viewing. The simple menu-driven programming provides user selectable digital filtering to improve readability in rapidly varying applications. All parameters are stored in non-volatile memory so that reprogramming is not necessary in the event of a power failure. The unit is CE compliant for RFI, EMI, and ESD immunity and is also available with an optional relay that is programmable through the front of the meter.